It’s no wonder Scandinavians have a bit of a rep for being a healthy bunch – they have some of the best grub going. And now a taste of that Scandi diet is making its way to the capital for The Great Nordic Feast. As part of Nordic Matters – the Southbank Centre’s year-long celebration of arts and culture from Sweden, Denmark, Norway, Iceland and Finland – top chefs are coming to cook for Londoners. Among the line-up of Scandi cooking greats hosting creative culinary talks and dining experiences are Titti Qvarnström (Sweden’s first female head chef to win a Michelin star) and Icelandic star chef Ylfa Helgadottir, who’ll be flying in just for the event. And ‘The Great British Bake Off’ 2010 winner Edd Kimber will be bringing his take on Scandinavian baked treats to the table too. Forget the slipper-socks and ‘staying in’ message of British-appropriated hygge. This Nordic blow-out is about eating, sharing and meeting new people (but mostly eating). 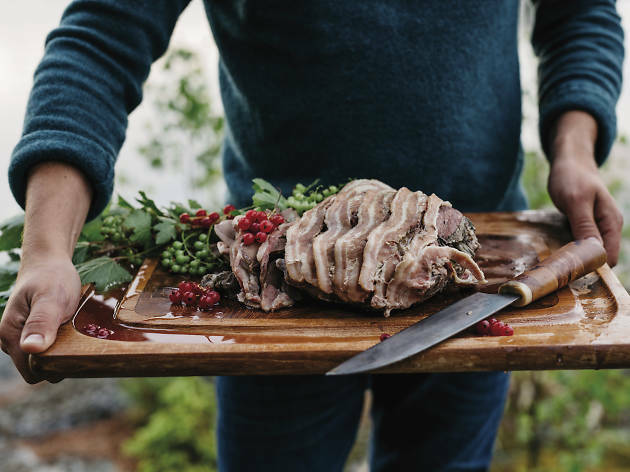 In a series of meals across the weekend, you can chow down on a Nordic breakfast – served the traditional way, as a smörgåsbord – or a packed dinner of the chefs’ signature dishes. Fill up on Nordic falafel with green peas and onion, Greenlandic halibut and charcoal-grilled reindeer with lingonberry salsa. And there’ll be plenty of fresh Scandi breads to go around, too. Arrive hungry: leave as plump and happy as a Moomin. What is it… A weekend-long food fest full of slap-up Nordic meals. Why go… To eat like a Viking (only better, and without all that bad karma). The Great Nordic Feast is at Royal Festival Hall from Fri Oct 20-Sun Oct 22. Find out more and book tickets here. Hungry for more warming fare? Check out our list of London's finest veggie comfort food. Want more elaborate feasts? Why not dine out as if you were in Beauty and the Beast? Clare is the sub editor at Time Out London. She won’t go north of the river at the weekend unless there’s a decent cup of coffee in it. Follow her on Twitter @ClareVooght.